Paulann Petersen served from 2010 – 2014 as Oregon's sixth Poet Laureate. Please see the Oregon Poet Laureate page on this website for links and other information related to the office and its mission. Paulann Petersen is a former Stegner Fellow at Stanford University whose poems have appeared in many publications including Poetry, The New Republic, Prairie Schooner, and Wilderness Magazine. Her first full-length collection of poems, The Wild Awake, was published by Confluence Press in 2002. A second, Blood-Silk, poems about Turkey, was published by Quiet Lion Press of Portland in 2004. A Bride of Narrow Escape was published by Cloudbank Books as part of its Northwest Poetry Series in 2006. Kindle was published by Mountains and Rivers Press in 2008. The Voluptuary was published by Lost Horse Press in 2010. Her latest book, Understory, is also from Lost Horse Press, 2013. In addition to her full-length books, she has five chapbooks—Under the Sign of a Neon Wolf, The Animal Bride, Fabrication, The Hermaphrodite Flower, and Shimmer & Drone—as well as three collaborations: Dark River of Stars; Alfred Edleman: Urban Compositions; and Timeless Flow. Her work has been selected for the website Poetry Daily and for Poetry in Motion, which puts poems on buses and light rail cars in the Portland metropolitan area. 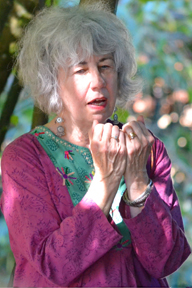 The recipient of Oregon Literary Arts' 2006 Holbrook Award and Willamette Writers’ 2013 Distinguished Northwest Writer Award, Paulann has taught a number of poetry workshops for colleges, libraries, and writers' conferences, including Mountain Writers Series, The Attic Institute, Fishtrap, Oregon Poetry Association, and Northwest Writing Institute at Lewis & Clark College. She serves on the National Advisory Board for Friends of William Stafford.